Indianapolis, IN (September 2017) – The Division of Undergraduate Education is hosting Donuts with the Dean in Room 104 of Taylor Hall on Tuesday, October 10, 2017, from 10:00 a.m. to 11 a.m. The event will be an informal gathering for the division’s Dean and Associate Vice Chancellor for Undergraduate Education James “Jay” Gladden to meet undergraduates. Students can receive a free donut and will be able to ask the dean questions. 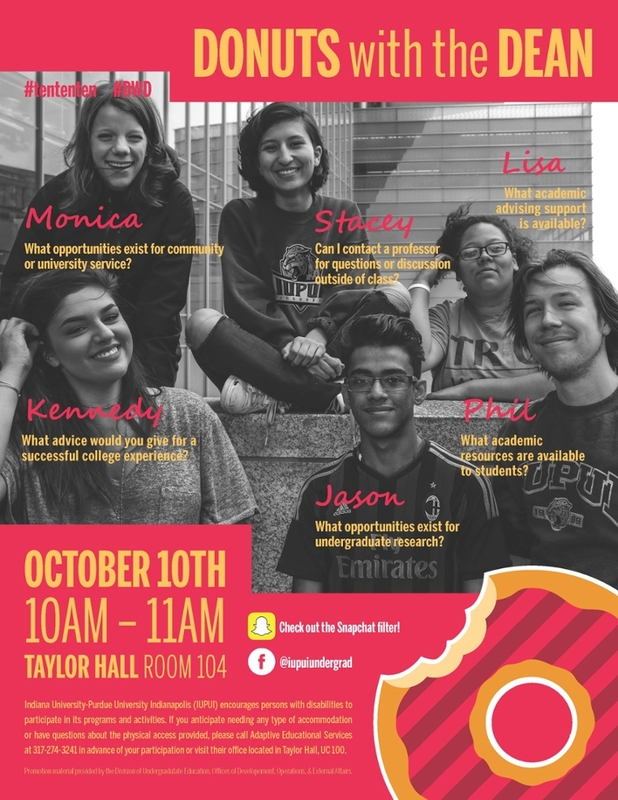 In addition, this event will provide an opportunity for students to voice opinions and to offer suggestions regarding IUPUI, the division, and the division’s student support unit, University College. Donuts with the Dean is one of the efforts that the Division of Undergraduate Education will be making this year to welcome students and to receive their input regarding the campus and the division.